Regular expressions are used in almost every programming language and are better known as regex or regexp. You find them in many types of applications. If you have never seen a regex before, they may seem a bit complicated due to all the special characters. Luckily, they turn out to have a clear structure. A regular expression can be used to search data. This may be a long text in which you want to search or replace a specific string, or a set of urls that you want to rewrite in a .htaccess file. Instead of searching for an exact match of your search query, a regex searches for patterns. For example: you may use Google Analytics to gather statistics of your website and you want to know how many people visited a page with a date in the url. Instead of defining your search query as ‘show me the pages where the url contains 01-01-2013 or 02-01-2013 or …’ you simply use a regex: ‘search for pages where the url contains dd-mm-yyyy’. The first regular expression will match the numbers 0 to 9, while the last one only matches expressions that do not contain any number. forms a match with ab, abb and abbb. The characters ^ and $ are used in a regular expression to indicate the start and end of a string, respectively. forms a match with ‘we are PLint’. Be careful: the symbol ^ is also used within the square brackets  to indicate that characters should not be from the set between the brackets. For some often occuring expressions an abbrevation may be used. \d indicates any number between 0 and 9, \s indicates a whitespace, and \w will match any number, character a-zA-Z or underscore. will match with both PLint-sites as Plint-sites. Although regular expression may seem a little complex, they are very powerful once you know how to use them. There are several tools available on the internet to help you write a regex. For example, there are regex testers that show realtime which part of a text is matched by your expression. Another nice tool to test your regex skills is the regex crossword challenge. Starting with simple exercises, you will definitely get experience with the more complex regular expressions. Regular expressions offer lots of possibilities to search parts of text, to selectively rewrite urls within a .htaccess file or to filter statistics within Google Analytics. The examples in this blog post are very simple and only meant as an illustration of the possibilities. 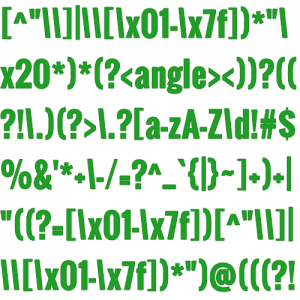 Time to get started and write your own (complex) regular expressions! This entry was posted in Development and tagged regex, regular expression on 7 January 2014 by Leonie Derendorp.